Leverkusen - Bayer 04 Leverkusen closed the gap on FC Bayern Munich at the Bundesliga summit to nine points heading into the winter break courtesy of a comfortable 3-0 win against Hamburger SV. 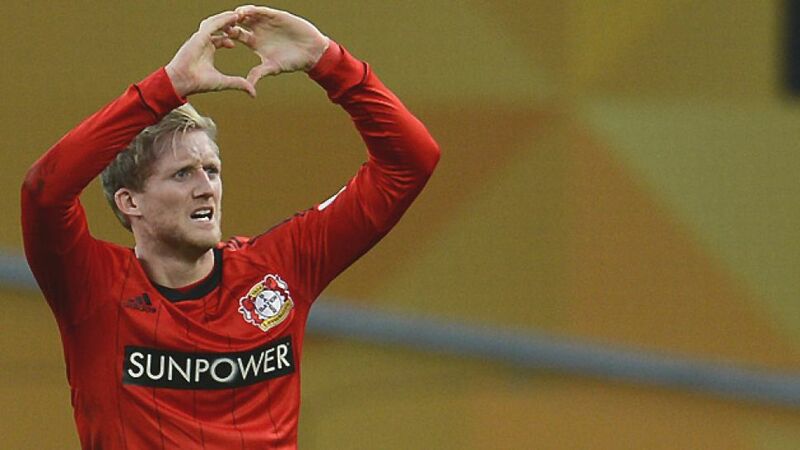 Andre Schürrle and Stefan Kießling had the beating of the in-form Northerners and, within ten first-half minutes, combined twice to each get themselves on the scoresheet. Kießling completed his brace in the second half to put himself top of the Bundesliga's goalscoring charts, stretching Leverkusen's unbeaten home streak under Sami Hyypiä and Sascha Lewandowski to 14 games in the process. There was no rest for the weary with the two sides' direct approaches making for a lively opening. Artjom Rudnevs stung the palms of Bernd Leno inside a minute, but Hamburg almost became the creators of their own downfall when Dennis Aogo's errant pass allowed Schürrle in behind. Fortunately for the visitors, the Germany forward rattled the woodwork for the fourth time this season. A lull in proceedings presented HSV with an opportunity to settle, but while Heung Min Son went close with a speculative effort from range, they weren't creating anywhere near as many chances as their hosts. Much of the pre-match talk had been of Rene Adler facing his former club, but after producing some routine saves early on, the keeper could do nothing to prevent Bayer from taking the lead. Gonzalo Castro got the all-important flick on Schürrle's cross to take it into the path of Kießling, who netted his 24th goal of the calendar year with aplomb. Rudnevs almost produced an immediate response only for his header to come back off the post, but Leverkusen heeded the warning and pushed forward for a second. Hamburg were struggling to contain Schürrle and Kießling's movement and when the goalscorer turned provider, Schürrle left Michael Mancienne rooted to the spot before calmly slotting into the bottom corner, handing the hosts a two-goal advantage at the break. Torsten Fink's half-time team talk produced the desired effect and Leverkusen's Leno was forced to prevent Milan Baldelj and Son pulling a goal back. The hosts weren't about to let Hamburg back into the game, though and soon sought to press their advantage. Adler was twice called upon to deny Schürrle, first smothering the ball in the box after the forward's heavy touch before tipping a dipping effort onto the bar. However, another defensive error soon undid his good work as Heiko Westermann allowed Leno's long-ball to bounce. Kießling pounced on the opportunity to bag his brace, lifting the ball over the onrushing Adler. With the game well and truly won and Hamburg failing to carve out any clear-cut chances in return, the closing stages were played at half-pace with Leverkusen looking the only side likely to add to the scoreline. A fourth goal was not forthcoming, though, as HSV remained winless for the fourth consecutive match on the road, while Bayer made it six wins in as many games at home to close out 2012 in style.